Blend into drinks and smoothies, stir into yoghurt, or sprinkle over breakfast cereal. Tastes great straight from the spoon, without leaving an oily residue in the mouth. Sprouting creates a stable product which DOES NOT REQUIRE REFRIGERATION. The process of germination or 'sprouting' transforms the seeds into a living superfood. Sprouting increases the seeds' nutrient content and decreased their amount of 'anti-nutrients' and tannins. This allows for increased nutrient absorption. They are a good source of lignans and dietary fibre. Sprouted Flax Seeds are milled to a coarse, golden powder without using heat or friction, which reduces nutrient loss and increases stability against rancidity. Organic Sprouted Flax Seeds are naturally sweet and grassy-tasting. Lignans are phytonutrients, which help maintain healthy hormone balance. Fibre helps maintain healthy bowel and cardiovascular systems. Sprouted Flax Seeds are a rich source of protein and alpha-linolenic acid, the Omega 3 essential fatty acid (EFA). They provide linoleic acid, the Omega 6 EFA and the monounsaturated fatty acid (FA) Omega 9. Sprouted Flax Seeds also contain Choline and the minerals Calcium, Magnesium, Iron, Potassium and Phosphorous, with trace amounts of B vitamins, Vitamins C and E and Beta Carotene. What's the difference between ordinary ground flaxseed and sprouted flax seeds? Flaxseed has natural enzyme inhibitors to prevent digestion. Eating powder form of regular golden flaxseed will not maximize the nutritional value. In order to overcome the problem created by enzyme inhibitors you can sprout the seed. The sprouted flaxseed has much more bio-available nutrition than just grounded golden flaxseed. The purpose of the enzyme inhibitor is to prevent digestion. This is Nature's way of ensuring that animals, birds and humans distribute the seeds in a form in which they can still germinate. When they eat them, they pass through the body whole, and they are spread around the planet. However, even though we get no nutrients as such from the whole seeds, they do soothe the gut and help with smooth transit of foods through the digestive system, and so even the whole seeds are of benefit to us. To get the nutrients described above though, we need to sprout the seeds, which not only increases the nutritional value, but also releases them. Sugar, salt, starch, soya, wheat, gluten, maize/corn, lactose, dairy products, artificial preservatives, colours or flavourings. 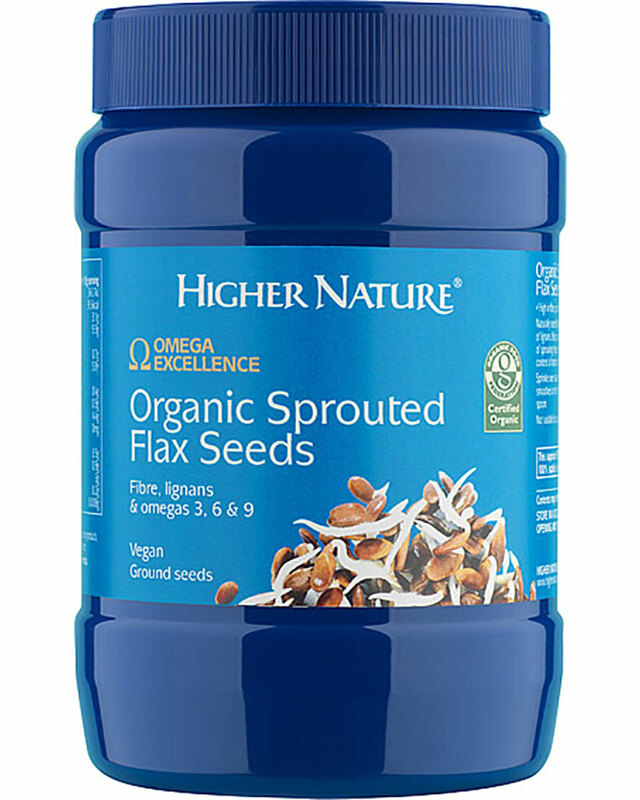 Higher Nature Sprouted Flax Seeds are packaged in specially-made opaque, recyclable PET tubs, which help protect the ingredients against harmful UV light and oxygen.